X-ray prism lenses (XPLs) and Fresnel lenses can be used for illumination purposes in the hard X-ray wavelength regime as they are used in visible light regime. We develop polymer lenses for certain applications in full-field X-ray microscopy and other imaging techniques. The sample illumination in a full-field microscope application should fulfil three requirements. First, the overall transmission of the condenser should be high. 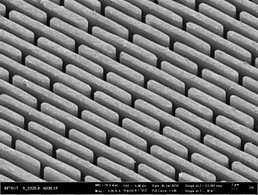 This is achieved by using thousands of refracting micro prisms with edge lengths in the tens of micrometre range. In this way the ratio of refracting surfaces to absorbing bulk material is optimized. The production challenge is the high aspect ratio of such micro prisms. 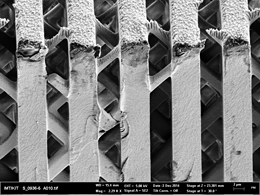 In this project we develop condensers fabricated via deep X-ray lithography. Second, the intensity in the sample plane shall be homogenous across the whole field of view. And third, the rays coming from the illumination optics shall be accepted by the objective lens. At high brilliance synchrotron sources the beam size is limited by the low divergence of the beam from the undulator source in vertical direction. This relatively small beam cross section limits the available field of view for full-field imaging. For many applications a larger field of view is desirable e.g. for medical, or biological samples or in materials science where the sample size is given by the manufacturing process. To cover long samples, several height steps are scanned and the tomograms are stacked, which is time consuming. Furthermore, the Gaussian-shaped beam profile is not ideal for full-field imaging where a more constant intensity over the sample would be advantageous. 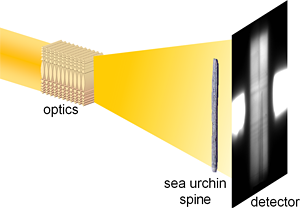 To overcome these limitations we developed refractive beam shaping optics, produced via deep X-ray lithography using SU-8, a radiation stable epoxy based polymer. The designed optics consist of biconvex Fresnel-elements defocusing the beam. The local curvature is tailored to widen the incoming beam and at the same time change the incident Gaussian-like beam profile to a top-hat intensity distribution. 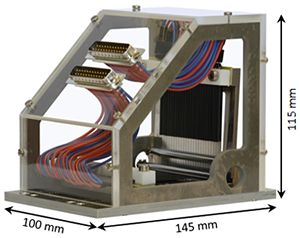 When testing the beam shaper at the P05 beamline of PETRA III (Hamburg, Germany) operated by HZG, we were able to widen up the original beam profile in vertical direction from 1.9 mm to 6 mm. Due to the fact that we are free to shape the facet of the lens for a certain purpose, it is possible to generate any desired intensity distribution with a suitable designed beam shaper of this type. 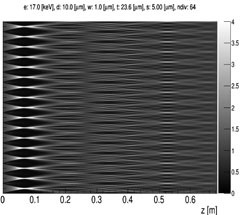 Left: Image of beam profile at P05, with beam shaping optics widening the beam. 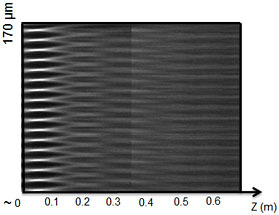 Right: Beam profile changes from Gaussian-like (1) to more top-hat like distribution (2). Due to absorption in the lens material, the aperture of Compound Refractive X-ray Lenses (CRLs) is absorption limited, and so is the numerical aperture. When using CRLs for full-field microscopy at laboratory sources, most of the large-angle radiation from the sample is lost. The basic idea of this project is to overcome this by using an array of CRLs with slightly tilted optical axes, which intersect in one point in the sample plane. By imaging the same field of view from slightly different directions, the exposure time can be reduced drastically. In principle the photon flux on the detector could be increased by a factor of n2-1 with an n x n multi-focus CRL. 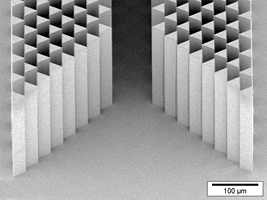 Working principle of multi-focus CRLs: The sample is imaged by an array of CRLs (here 3 x 3) with slightly tilted optical axes. The resulting nine images of the same field of view are detected indirectly via a scintillator (X-rays: yellow; VIS: red). 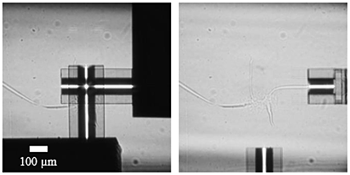 The capillary acts as an illumination optics, which is necessary for full-field microscopy at micro focus sources. A drawback of Compound Refractive X-ray Lenses (CRLs) made from polymers is their limitation to be used only in a monochromatic beam at synchrotron sources. As the thermal heat conduction coefficient of polymer is low, the power of a white beam would heat up the CRL too much and destroy it. In this project we develop a CRL, where a liquid is pressed through nozzles with double parabolic cross section. The jets formed are used as line focussing lens elements when X-rays pass perpendicular to the liquid jets. Optics with an easily adjustable focal length will serve X-ray microscopy a lot. An X-ray zoom lens renders the possibility to freely choose the magnification factor in full-field microscopy without moving the objective lens. The distance between sample and image plane can be kept constant even when changing the photon energy. With such optics even X-ray spectroscopic measurements can profit, as in spectroscopy changing the energy is inherent in the method. At IMT Compound Refractive X-ray Lenses (CRLs) have been developed. These lenses show good optical properties in the hard X-ray regime for photon energies above about 8 keV up to about 100 keV. 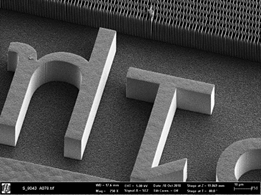 Until now several customized lens layouts for applications are processed on one substrate. So one can select the most suitable lens, shift it into the beam, slightly readjust the system and use the lens. To achieve an adjustable focal length single lens elements have to be moved out and back into the beam. Therefore in this project we use piezo bender actuators to bend previous sawed substrate stripes carrying lens elements at the end out of the optical path and precisely and reversibly back into the beam. This so called X-ray Zoom Lens (XZL) is remote-controlled. In comparison to a transfocator with a focal length in the meter range, an X-ray zoom lens can provide focal length in the centimetre to meter range. The zoom lens has a small overall size and can therefore easily be mounted in different beamlines. It allows for fast switching the focal length. Therefore we are always looking for new application and measurement methods where these new possibilities can be used. Micro-contamination of alumina powder in aluminum metal sheet, and so on. This activity is part of the Momose ERATO (Exploratory Research for Advanced Technology) phase imaging project funded by JST (Japan Science and Technology Agency) (Katsumasa Ikematsu, katsumasa ikematsuDgn9∂partner kit edu) and of the 2 by 2 BMBF projects HyReXPhI (Martin Börner, martin boernerNsh7∂kit edu). It is also part of the PhD thesis of Talgat Mamyrbayev (talgat.mamyrbayev@kit.edu). 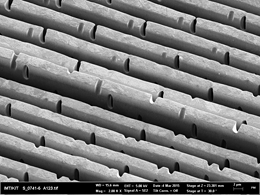 biconcave shaped lamellae (period: 10 µm, DC: 0.1, lamella thickness: 23.64 µm). Characterization of new geometry gratings at synchrotron beamlines like those at KARA or Spring-8. X-ray imaging experiments to identify the advantage of the new concept in absorption and phase contrast. 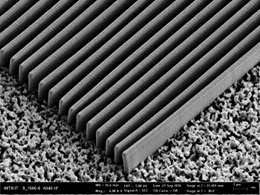 High quality absorption gratings, are fabricated routinely for energies up to 30 keV with heights of 50 µm to 70 µm using deep x-ray lithography. Phase gratings are fabricated with continuous lamellas out of nickel or gold. Shifting to higher energies, most interesting in materials analysis, the fabrication of absorption gratings, in particular G2, becomes challenging: the absorbing grating lamellas must be high enough to fully absorb the high energy X-rays (e.g., to absorb 90% of 100 keV X-rays, the gold thickness has to be 230 µm). In addition, the period needs to be small (2-5 μm) to ensure high sensitivity of the system. optimizing the design and the gratings geometry to obtain the minimum possible deviation from an ideal grating. 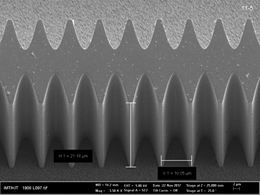 Differential phase contrast imaging today can rely only on gratings with periods > 4.8 µm. For building X-ray imaging set-ups of less than 1 m with acceptable resolution it is necessary to push the limits of grating periods. 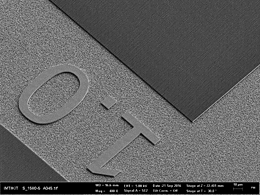 The resolution of the acquired X-ray images depends strongly on the quality and aspect ratio of the X-ray gratings which requires the use of X-ray lithography to fabricate gratings with periods less than 2µm and heights of more than 50µm. 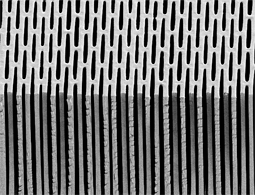 The fabrication of sub-µm gratings is challenging and involves several parameters in the entire fabrication process. 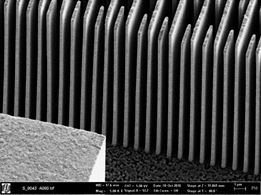 The quality of such sub-µm gratings strongly depend on the stability of the resist template with continuous lamellas, which can suffer from shrinkage, bending and sticking during fabrication. This becomes more critical with decreasing structural widths. The exposure and development conditions can also generate variations in the outcome, and also physical effects on the nanometer level like photo-electron penetration.